If you are interested in roller derby, you will need the right skates. There are many different skates that you will have to choose from, so it’s important that you take the time to select the right ones. There are myriad things to consider when shopping for the right skates, so you will need to take all the time necessary to research your options. The very first thing that you will need to keep in mind is that only quad skates are used in roller derby, which means no inline skates at all. These skates have boots with a low cut so as to maximize range of movement. If you are not able to move your legs freely enough, you aren’t going to get very far in the world of roller derby. These skates are available mostly in men’s sizes, and you will need to make sure the ones you get fit just right. Derby skates typically have either nylon or aluminium plates, and it’s important that you know the difference. Most people who are involved in roller derby gravitate towards aluminium, as they tend to be more lightweight. 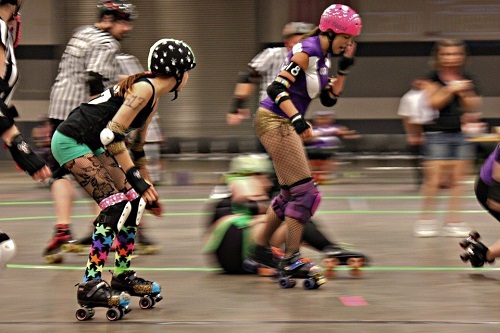 When you are doing roller derby, the last thing you want is any extra weight on your body. Nylon plates are acceptable, but they just aren’t as durable or light as aluminium ones. When you are shopping for roller derby skates, it is important to keep in mind that you get what you pay for. You can get a decent pair of skates for a somewhat reasonable amount, but it’s always a good idea to save up for the best possible ones. Beginner’s skates range from $100 to $150, intermediate derby skates are usually around $250, and the higher-quality ones can easily be $500 or more. You will want to think of the money that you spend on your skates as an investment, because that is exactly what they are. The angle of the trucks on your skates is another important factor that should be taken into consideration. Most skates have a truck angle of anywhere between 10 and 45 degrees, though there are a wide range of options to choose from. You should also think about the cushions on the trucks, as this will determine how long your skates are going to last. The two cushion designs for derby skates include the “cone” and barrel.” You should look for skates with a cone design as this offers increased turning ability that will be useful in roller derby. When it comes to finding the right roller derby skates, you do not want to rush into a final decision. As long as you take an adequate amount of time to review your options, you should be able to get exactly what you need to gain an edge on the competition. This entry was posted in Other Sports and tagged Roller Derby. Bookmark the permalink.